Cookie, the dog and her half eaten bowl of kibble. If you love dogs, this little story may make you weep copiously. So grab some tissues and read on. 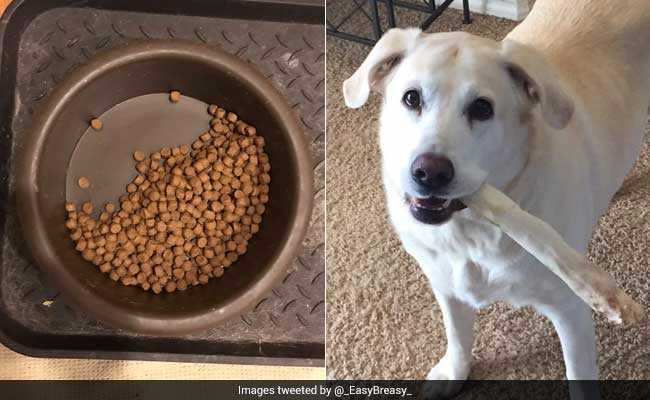 A tweet going viral tells the heartbreaking tale of a dog who only eats half her food. Twitter user @_EasyBreasy_ has shared the story of his two dogs Stitch and Cookie that's now collectively breaking the hearts of all dog lovers who read it. Since being posted on June 11, the tweet has collected over 41,000 'likes' and more than 19,500 retweets on the microblogging site. In the tweet, Twitter user @_EasyBreasy_ has shared a picture of a half-eaten bowl of kibble. Along with the picture, he shares a small note explaining the leftover food. He explains that since he has only one food bowl in his house, his dog Stitch taught his fellow Labrador to only eat half the food in the bowl. So Cookie would always leave half the food for Stitch to eat after her. Sadly, Stitch died a little time ago but Cookie still leaves half her bowl of food for her friend. The Twitter user later shared pictures of his dogs on tweeple's request. The heartbreaking story has touched a chord with many on Twitter. "I'm crying oh my god," says one Twitter user. "Now I gotta clock back into work and explain why I'm crying," says another.